Mikhail Mirzoev holds a Diploma of Graduation from the State College of Music in Moscow and a Diploma in Teaching and Performance from the Kazan Conservatory of Music. He studied violin with T. Kazansky and P. Ichenko who were themselves students of M. Fikhtengolts and I. Bezrodny. Mr. Mirzoev attended a three-year course in composition with Dr. Lehmann at the Moscow Conservatory of Music. He received numerous awards for composition, which have been performed in prestigious concert halls in Moscow. 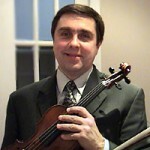 Mr. Mirzoev was concertmaster of the Celebrity and Brampton Symphony Orchestras for many years. Currently, he is regularly performing with the Brantford Symphony Orchestra and is a member of several quartets and chamber ensembles. Mr. Mirzoev works for the Toronto District Board of Education as a string instructor, directing the children chamber ensembles in the Mississauga School of Music and also teaches at his private studio. His students have won numerous awards and scholarships from competitions and festivals and the Silver Medals from the RCM Examinations.